Mfg. TURF-AIRE, MODEL 770TEM30, SER. # 2000101 (Heavier red-colored one), pulls a plug. Green Brinly model scrapped 11/13/17-51" TIRE TO TIRE -- 39" PLUG TO PLUG Brinly model is green-colored & not as wide, but longer than other..only makes small plug. 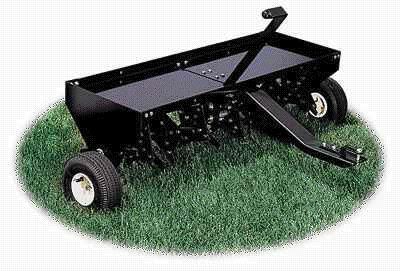 * Please call us with any questions about our aerator tow behind rentals in Tulsa OK and neighboring communities in Northeastern Oklahoma.